First, a housekeeping note. I’m introducing a new series of posts on the blog called “snapshots” (super inventive, I know). There are lots of neat things do to in Oman that don’t require a lot of explanation, or, even though I enjoy them, I simply don’t have much to say. But what I do have is lots of neat photos! First up is the Muqil Pools at the northern end of Wadi Bani Khalid. The best way to finish off a desert glamping trip is with a stop at the Muqil Pools. It’s about an hour away from the major desert camps in the Wahiba Sands, and you can enjoy the beauty of a wadi without any of the work. You can find it easily in Waze, and then it’s just a quick walk. There’s a restaurant where you can get lunch and there are also a number of nice picnic spots. Keep walking up the wadi to find some nice swimming spots. 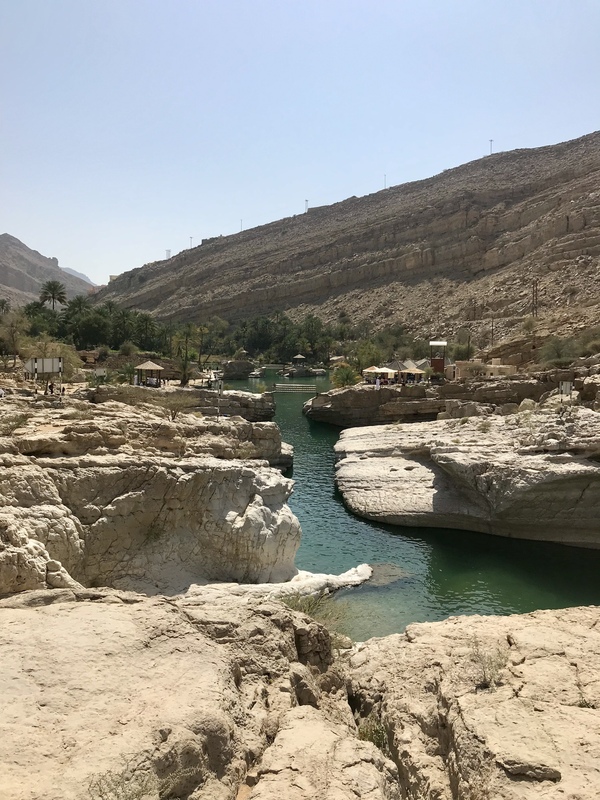 If you want to do a real wadi hike, Wadi Bani Khalid goes in the other direction too and is called Wadi Hayer or Hawer. OmanTripper has a good post about that. We haven’t checked it out yet, but we hope to before July! The wadi gets a lot prettier the further in you go. There are also a lot less people. The big pay-off: swimming in the beautiful pools all by yourself! ← Let’s go to the fair! I mean, the Muscat Festival. According to Athena is on Facebook! The views and opinions on this blog are solely mine, and they do not reflect the views of the State Department or the U.S. Government. In addition, the views and opinions expressed here do not reflect those of our dog Athena because she is a dog and we have no idea what she’s actually thinking.